My first experience with a Stretch wasn’t 100% positive. My first thoughts were that I didn’t like the SS and the kraton inlay. Still, I wasn’t quite able to put it away. It’s been on the kitchen table for a long time and has proven itself to be a really fine knife. Still, the handle wasn’t what I like for EDC. It was kind of heavy, the kraton sticks to the pocket a bit and there was a sharp point on the handle-side of the choil that pinched me a bit in the long run. The new Stretch proto at the A’dam Meet seemed to solve all those things. This Stretch is IMO a perfect knife for the connoisseur. Its looks might be plain, the blade might seem too thin, but for the knowledgeable knife enthusiast it’s a very impressive folder. The Stretch is a very fine cutting instrument, much like a supercharged Calypso jr. The full ZDP blade is nicely polished. Much more so than other Spydies, with the exception of the original Moran. This polished finish does a nice job –in my case- of preventing the patina forming on the ZDP, and I suspect it helps the cutting efficiency. It’s also fun to see water just floating off the blade. The blade is thin, although in my sample the edge was ground a bit thicker; 40 degrees rather than 30 or less. Still, the cutting performance is simply superb. The blade shape is very versatile. The Stretch works just as well, cutting food on a board and breaking down boxes, as it does opening the mail, cutting out coupons or cleaning your fingernails. The blade shape and size is ‘just right’ in my book. It makes for a folder compact enough to carry 24/7, yet it’s long enough to cut a bagel for example. The ZDP holds its edge very well, as I’ve become accustomed to with this steel. When sharpened at a 40 degree angle it just gets boring to see how long a working edge lasts. As mentioned before, the blade offers enough curve to work on a flat surface, but the point is there when you need it for removing a splinter or cutting out a coupon. The curving spine also provides a natural sweet spot for my index finger, for precise cuts. The blade stock isn’t very thick and it tapers to a very fine tip. When I drag my thumb a bit across the tip, I can feel a little “twoing” going through the blade. I suspect that it isn’t hard to break the tip. I really appreciate this ‘delicate’ point. The knife connoisseur will recognize this knife as a cutting and slicing tool, and will take care to use it for these types of chores. In return, you get the possibly sharpest point and edge in a production folder. Don’t get a Stretch II if you’re looking for a folder for rescue work or a war zone. The handle is thin and very ergonomic. The peel-ply carbon fiber definitely ads ‘warmth’ to the handle, compared to the SS and kraton on the original Stretch. The texture is not as aggressive as on regular Golden made G10 folders. In my book, the texture is ‘just right’; grippy enough to maintain the grip when I was cutting through 1kg of beef for a dish and smooth enough to comfortably carry and draw from a pocket. In the past month, I haven’t noticed any deterioration of this texture. It’s still just as grippy as it was from the box. Golden made G10 folders tend to lose a bit of texture after one month of constant carry, to reach a steady level of smoother texture. I suspect that the carbon fiber is simply much harder than the extra glass filled G10 that’s used on other high-end spydies. Also, I suspect that the microscopic peaks and valleys in the peel-ply carbon fiber are either more rounded or more apart than in G10, since it doesn’t seem to attract as much dirt or skin cells. 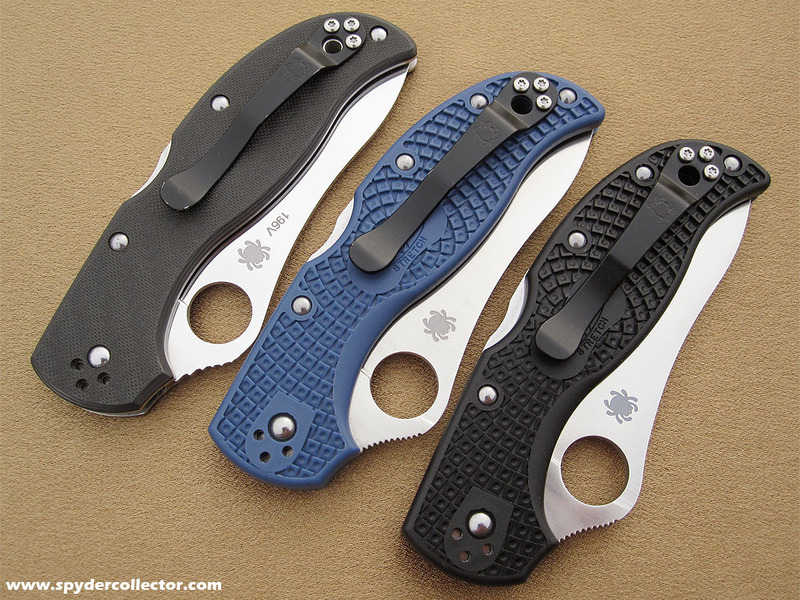 The Stretch is a wonderful knife to hold and it offers good purchase in all the major grips. Thanks to the carbon fiber, the sharp point near the choil on the older Stretch is much more rounded. The Stretch certainly feels a lot lighter than the first Stretch, both in the hand and in the pocket. Despite all this gripping comfort, the handle is still very compact. The blade to handle ratio is much closer than in most other spydies. Again, the word ‘just right’ comes to mind. The thin Stretch reminds me a bit of the Military; that knife is also relatively thin which makes it that much more comfortable to carry. There is one aspect of the Stretch I don’t like; it’s the ‘step-style’ jimping on the spine behind the opening hole. I much more prefer the finer jimping you find on the Delica 4 and current production Salts. 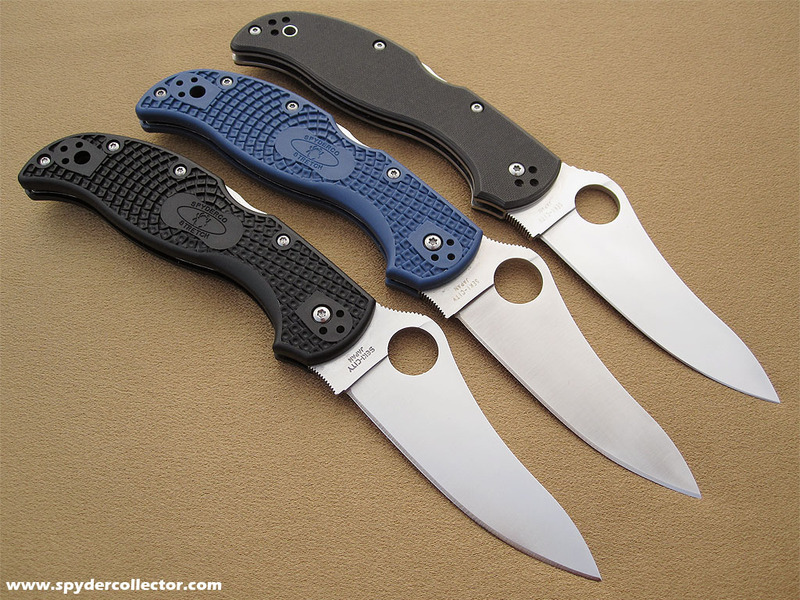 With all the experimentation in jimping styles in spydies over the past year, it seems that Spyderco settled on the D4 style jimping. Why not use it on the Stretch II? Especially when it’s used inside the choil of the Stretch II? The Stretch is a wonderfully designed knife. It may look understated to the untrained eye, but the materials are top notch. When you start using and carrying it, the subtle design features will become apparent. To me, all the bigger and smaller design features of this knife add up to an EDC utility folder that’s ‘just’ right’. Change the jimping and offer a full SE version of the Stretch (I don’t mind carrying two folders), and I’ve found my perfect folder (for now at least). As is, the Stretch II has knocked my beloved Mini Manix out my pockets for off-work EDC. This entry was posted on Saturday, February 2nd, 2008 at 6:06 pm and is filed under Carry Folders. You can follow any responses to this entry through the RSS 2.0 feed. You can leave a response, or trackback from your own site. My name is Peter and I am from Budapest, Hungary. 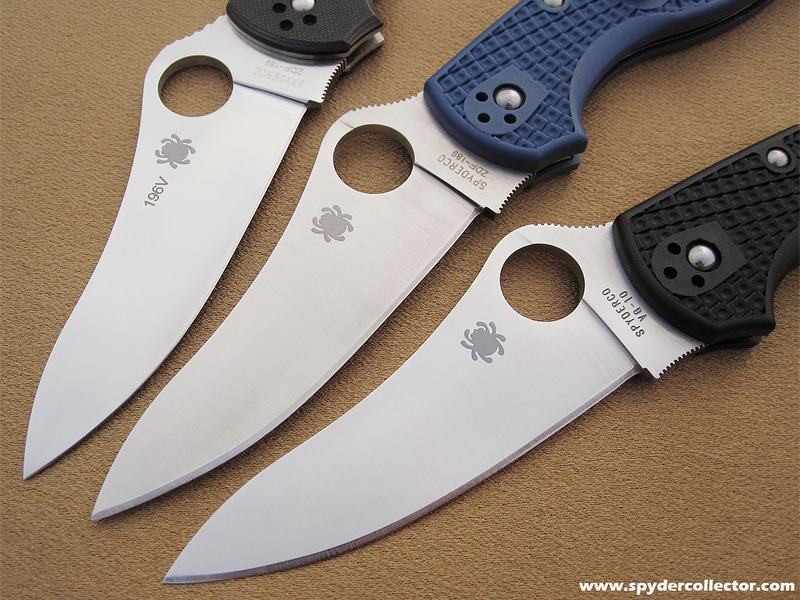 I’ve been into the collection of Spydies for quite a while now and would like to ask you a general sort of question that has come to my mind in connection with my VG-10 Stretch II, but applies to virtually all of my VG-10 and ZDP-189 blades: it is that brownish patine that develops on the steel surface after a few hours of handling the “newcomer”. Is it, in your opinion, caused by a chemical substance the hand normally exsudes or is it the sweat, an acidic substance, or WHAT? It really does not do anything to the blade, so my question is of a purely cosmetic nature. Nontheles, could you make any suggestion as to how I might remove those stains from my blades? thank you for the advice, polishing has almost entirely removed the patina from the blade. On the other hand, it is comforting to know that the phenomenon is not to be considered a defect. In the meanwhile the Stretch 2 has taken up an important position as a weekend/outdoors carry. Thanks again, and congratulations for this edifying and aesthetically pleasing website:-). I am planning to remain a regular visitor. Thank you for the compliment Peter, I’m glad it worked out for you. great review, great job on the pics, as always. I came across this passage just now, I got a Stretch blue FRN ZDP as b`day gift lately and I have to agree almost on all what you said up there. My experience is like Jano’s — nothing to cause a second glance at the knife until I read about it … and then ordered the CF model. The day it arrived, I ordered another, and I’ve been happy ever since. It’s been my EDC ever since I got it/them. I’ve always admired your photos and just came across this entry and thought I would tell you. Thanks very much. Thank you for the kinds words, especially coming from such a talented photographer! Reflective things are some of the toughest to capture well and you do that beautifully. Plus your arrangements and settings and backgrounds always manage to hit that sweet spot between technology and art — adding to people’s understanding and appreciation.